When the pain is localised, you use avoir mal à + le/la/l'/les followed by the part of the body that hurts. Remember that à + le and à + les contract in au and aux . Sophie a mal à l'oreille. The expression avoir mal au cœur does not mean you're having a heartache or a heart attack, but that you're feeling sick, like you want to throw up. Mon frère a mal au cœur en voiture. My brother is car sick. Maurice a mal à l'œil. Roxane a mal aux yeux. 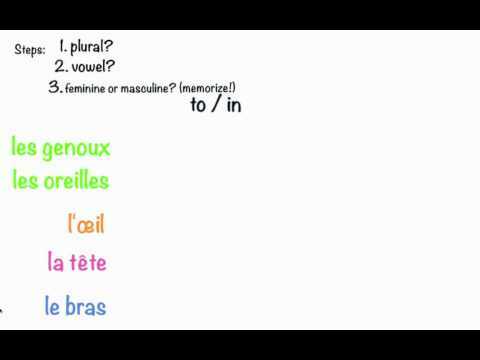 Note that the irregular plural of œil is yeux. Tu as mal au genou. Tu as mal au ventre. You have a stomach ache. One of the first sentences I learned years ago was “J’ai un mal du tête” for i have a headache. This was from a Parisienne. Was this less formal? Just a slight correction: J'ai mal à la tête. This is perfectly ok to say, and it is certainly not slang. I think Rose Marie meant "J'ai un mal de tête". I don't know if that would be considered less formal. This thread on WordReference suggests it's more complicated than that. On dit "j'ai mal à la tête" ou "j'ai un (violent) mal de tête"
Dans la deuxième expression, il y a toujours un adjectif pour qualifier le mal de tête. Another user says that there is often an adjective, but not always. How does one say "He has a bad knee" in French? ie, a chronically bad knee, as opposed to one that it is in pain right now? You would probably say : "J'ai un problème ( chronique) de genou" ( I have a knee condition /problem) rather than "j'ai mal au genou". How can you be more specific with pain? J'ai mal au genou gauche. Tu as mal à l'oreille droite. Il a mal à l'œil gauche. "ATTENTION: The expression "avoir mal au cœur" does NOT mean you're having a heartache or a heart attack, but that you're feeling sick, like you want to throw up." how do you say "my heart hurts" then? But it still leaves unanswered how you say that you are having a heart attack!